The old Irish symbol of fidelity, this Claddagh hair comb is a perfect gift for your love or perfect for a Gothic wedding. A skull peers from beneath the enamelled red heart in this gothic variant of the traditional, C17th, Galway symbol of eternal love, friendship and loyalty, by virtue of its heart, skeletal hands and crown, with bones from 'beyond the grave'. 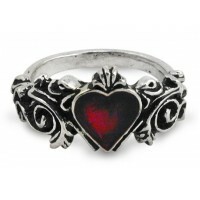 A beautiful piece of gothic elegance for the romantic at heart. 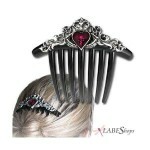 Pewter with great detail and red enameled heart is mounted to a high quality plastic hair comb. Comb is about 4 x 4 inches. Item Number: AG-HC3 | Approximate Size (Inches): 3.98 wide x 0.87 deep x 3.82 high | Approximate Shipping Weight: 0.50 lbs.